Dutch police closed a probe Friday into a fatal crash involving a Tesla, accepting the US electric car firm's findings that the Model S sedan was not on auto-pilot when it smashed into a tree. 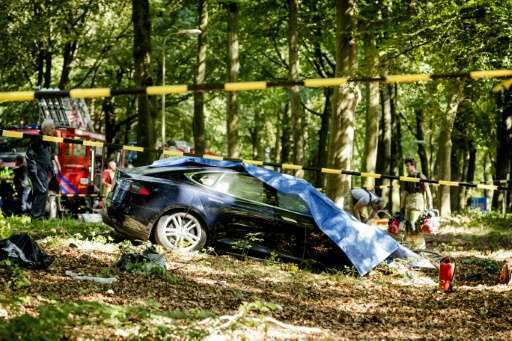 Tesla said the driver—who was killed in the accident—was in control of the car which crashed at high speed near the central Dutch town of Baarn on Wednesday. Police spokeswoman Thalia Luckel said the US manufacturer, which has a plant in the Netherlands, had informed them of its findings. "We do not dispute the results," she said in a statement adding that as a consequence "prosecutors indicate there will be no criminal probe". "The police will not investigate any further circumstances surrounding the accident," Luckel added. Tesla Netherlands in an earlier statement told AFP its findings were based on the car's logs which showed that "the auto-pilot had not been activated at any point". It added the log also showed "the car was driving at 155 kilometres (96 miles) per hour" which was consistent with the heavy damage to the vehicle. It is the second fatal crash involving a Tesla electric car, after a driver was killed in May in Florida while driving on auto-pilot. Dutch media reported the man killed on Wednesday was 53, from the town of Hilversum. The Dutch news agency ANP said it took fire officers several hours to recover his body as they feared being electrocuted. Tesla, founded by pioneer Elon Musk, has been seeking to revolutionise the electric car market, initially with high-end luxury vehicles but more recently bringing prices down nearer to a more mainstream market. Tesla is also probing an incident in France in August when a Model S sedan caught fire during a test drive in the southwestern town of Bayonne. In both cases, the cars involved hit debris on the road that pierced the chassis and caused a battery fire. Tesla has cautioned that the autopilot system, introduced last year, is not a fully autonomous system and drivers should be at the wheel and in control. The system allows the vehicle to automatically change lanes, manage speed and brake to avoid a collision. The system may be overridden by the driver.